The calamitous five years for Brazil’s sugar industry may be over, as the world price is set to rise, and a hitherto hostile government is on the defensive. The past few years have been calamitous for Brazil’s sugar and alcohol industry in Brazil, by far the world’s largest producer of sugar cane and until very recently, responsible for half all the sugar traded worldwide. Five years during which sugar prices were low, a much longer period than usual, coupled with the complete lack of support from an unsympathetic government, has forced the industry in Brazil to shut down of 80 of the country’s 300 or so mills. Brazil’s share of the 45mt (million tonnes) of sugar traded worldwide each year, previously more than half, has slipped to about 45%. All but the most powerful companies have been pushed deep into debt. Most companies are now being forced to sell ethanol fuel for about 10% less than it costs to make, in a desperate effort to raise the cash they need to keep going. Numerous companies either have left, or would like to leave, the industry, including such international giants as trading company Bunge and Spain’s Abengoa. But they have been unable to find buyers for mills they bought a decade ago, even for less than half what they paid for them. Many mills are selling some of their land for building or other purposes to raise cash, others are planting crops such as eucalyptus on hilly parts. Withluck,thesituationwill improvenextyear,largely because up to 5mt less sugar will be produced worldwide in 2016 than will be consumed. If a prediction made by the International Sugar Organization, the ISO, is correct and this largely depends on what happens in India and Thailand, both of which have pushed up output sharply in the past few years, it will be the first such shortfall for five years. Up to 20mt of sugar are now in stock, however, so sugar prices seem unlikely to fall soon, or by much. Many companies in Brazil are being hurt by the fact that the local currency, the real, has fallen by 30% against the US dollar in the past year. This means that servicing the industry’s large foreign debts costs more to service. But the weaker real means Brazilian sugar can now be exported for a lower price than most other countries can manage, yet still be profitable. The left-leaning government of the past few years has been extremely bad news for Brazil’s sugar industry. But so many things have gone badly wrong with the Brazilian economy in recent months that the chastened president, Dilma Rousseff, is now threatened with impeachment. With unemployment rising fast and many unable to keep up with debt payments, Rousseff is now only popular with 8% of voters. With the country in recession, tax revenues are shrinking, so the government has being forced to change course. Some measures which benefited the sugar industry, and which were scrapped a few years ago, have been re-introduced, amongst them a tax on fossil fuels. Scrapping the tax forced down the price of petrol, which in turn put a cap on the price at which ethanol fuel could be sold. The recent rise in the tax on fossil fuels has reversed this situation, and as a result, about 1.5 billion litres of ethanol have been sold each month during 2015, 20% more than in 2014. The proportion of ethanol blended with all gasolene has also been raised from 25% to 27%, which has created extra demand. A sales tax on ethanol was always kept low in Sao Paulo, Brazil’s leading sugar producing state, but other sugar producing states have now followed suit. Ethanol is now more attractive than gasohol in states which among them contain 60% of Brazil’s car fleet. The sharp fall in the prices of many commodities, coupled with gross mismanagement of the Brazilian economy and news of widespread corruption, notably of Brazil’s state-run oil company Petrobras, has resulted in the country’s currency falling by more than 30% against other currencies in the past year. This is notably the case against the US dollar, in which the world sugar price is set. The weaker real is compensating for the fact that the world price of sugar is now 23% lower than it was 12 months ago. As well as making exporting sugar more profitable, the weak real also means considerably more ethanol is being exported this year, notably to the United States. All but the few financially strong companies are having difficulty in paying their debts, a state of affairs which makes it seem likely that a further dozen or so mills will stop working this year. To raise much needed cash, mills are making and selling as much ethanol as they can, even if the fuel is having to be sold at a loss. A record 58% of the 600mt of cane to be harvested in the centre south 2015/16 is being made into ethanol, while before the sugar price began to fall, the same proportion was made into sugar. Most mills are putting very little ethanol into stock, fuel which it will be possible to sell for higher prices when harvesting is completed and the supply slows. The record sales so far this year means the fuel will soon run short. But only the very few financially strong companies, most of them foreign owned, which have been able to stock some ethanol, will make a killing when the price rises. The past few turbulent years for sugar have coincided with a revolution in the way cane is grown and more importantly, the way it is harvested. 20 years ago, virtually all the cane was cut by hand by an army of workers who migrated from the then poverty-stricken north east. Before being cut, the leaves were burnt off, so that workers were able to cut sufficient cane to make a living. Burning cane caused huge clouds of polluting smoke, and as concern about the negative impact of this grew, pressure for burning the cane to be phased out, increased. Giant mechanical cutters, capable of cutting up to 1,000 tonnes of cane a day, took the place of men and women. The costly process of substitution — a typical machine costs $100,000, and a fleet of other vehicles to carry the cut cane from fields to the main roads and mills, also had to be bought — is now virtually complete. Many fewer workers are needed than before, but many of those who remain operate machines and are paid far more than the old style cutters. With the world sugar price high and demand for ethanol thought likely to rise steadily, the industry set about building a new generation of giant mills a decade ago. Many companies stretched themselves financially to build 100 large new mills and to plant the millions of extra hectares of land needed to grow the cane. The plan was for the extra ethanol would be exported. But it proved impossible to sell as much ethanol to countries which import fuel, as had been hoped. The discovery of huge reserves of crude oil under deep water off Brazil’s shores, brought to a sudden end hopes that Brazil would soon be selling billions of barrels of ethanol around the world. The government, which at one stage was having a love affair with sugar, switched its affection to oil instead. Mesmerized by the success of state-controlled Petrobras in finding oil, huge sums were siphoned from the company by politicians and contractors. This has come to light in the past few months and the ensuing scandal has caused the government to stumble. Much of Brazil has experienced much drier weather in the past few years as in previous times, possibly the result of climate change. Water levels in the lakes which feed hydroelectric power stations and store the drinking water used in the large cities in the south east and north east, have shrunk dangerously low. Many mills had always sold surplus electricity generated from burning the huge quantities of waste left over after sugar has been extracted, in inefficient boilers. The 100 new mills have all been fitted with the latest generation of fuel efficient boilers, and because electricity has been in short supply because of the dry conditions, it has been sold for record prices. This has helped save many mills.. ‘Co-generation’, as it is called, is now responsible for up to 30% of the revenues of some mills. Although the summer this year has been exceptionally wet, there are few signs so far of water levels in lakes rising much, as water tables have fallen so much. With the building of a new generation of hydro power stations delayed, revenues from the sale of electricity should continues strong for some time. The cane which used to be crushed at the 80 mills which have shut down, has been diverted to the new ones. However, because little extra cane has been planted in the past few years, demand for cane is now virtually equal to supply. The world needs an extra two to three million tonnes of sugar each year, so more mills will have to be built somewhere to make it. But nobody is considering any new building in Brazil at the moment. There is some talk of Cuba, which at one time produced and exported about eight million tonnes of sugar, making a come- back, and this is not impossible. There has been a great deal of talk about ‘second-generation’ ethanol, which can be distilled from the sugar cane waste now burnt in boilers, or left to rot in the fields. 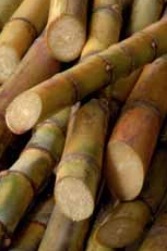 The leaves and tips, as well as new types of ‘energy-efficient’ cane, which contain less sugar and more leaves than the types now popular, are also used to make this ethanol. But making ‘second-generation’ ethanol from cane is a far more delicate process than the traditional one, in which cane is basically crushed between two huge rollers. Second-generation ethanol requires cane to be far cleaner and free of soil and other contaminants than the old method did, so the new process has not been profitable so far. An increasing amount of sugar is now taken from mills or railheads to ports such as Santos and Paranagua by train. The industry plans for 100% of the sugar to go by rail in the centre south at least, before long. Up to 10% of the 25mt of sugar now exported around the world by Brazil each year, is now packed in containers. Sugar is able to take advantage of the fact that because so many consumer goods have been imported from China and elsewhere in Asia in recent years, tens of thousands of empty containers are now surplus to requirement in Brazil. Being used to carry sugar is better than for them to leave empty. It is too soon to say whether this scheme will last, as Brazil’s imports from China have slowed markedly in recent months. Importing sugar in containers has advantages for some consumers, who can take delivery of the exact amount then need, when they need it.